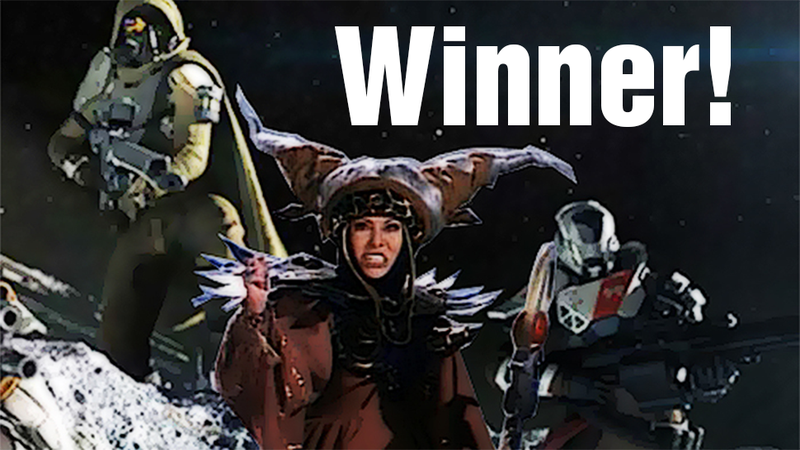 Kotaku 'Shop Contest: That Wizard Came From The Moon: The Winners! Last week our image manipulation savvy readers were tasked with visualizing "That wizard came from the moon", a line of dialogue spoken poorly by Peter Dinklage in the beta for Bungie's Destiny. I had no idea the phrase could be taken so many ways. For instance, depending on where the emphasis is placed in the sentence, things can get pretty horrible. Then there's the definition of "wizard" and "moon", which are open to interpretation. For instance, does a witch count? Judging by the overwhelming response to Hundredgunner's winning Power Ranger-themed entry, she pretty much has to. But Rita isn't everything. No, everything is what you'll find in this week's honorable mentions. Spencer — because that wizard is coming from the moon. slcdirtmerchant — because Cage can make this happen. DethDonald — because the internet. NellChan — because I'll count moonwalking. Chrury Sanson — because it's only a matter of time. Edible Giraffe — for old—school moon wizardry. JurassicBark — because I want some fries with that shake. Mbentley83 -- for the return of nightmares. SquareSide — for the second coming. SharedProphet — for the Moon reference. Bill Clinton — for the Moon reference. Skeearmon — for the Moon reference. KLR_Steve — for the Moon reference. MrDeadScott — because he will be missed. Pedro Silva — for Zardoz. uscg_pa — if you believe they put a mouse on the moon. Tristanix — because Moon Moon is never forgotten. Contrarianator — for the Keith Moon reference. Drewpy — because he does have mad style. Gambon10207 — technically a sorcerer, but I'll accept it. Septemtriones — even though they're going the wrong way. Irushionu — for confusing me into submission. AnxiousLogic is a contrarian. — your sentence is in another results post. Quinnsdaddy11 — because no one noticed. ahoihoi — for the mix-up. cartoonivore — crazy, duck in space! Duraigo — this explains so much. Arch Duke Maxyenko — now that's real driving. zombie711 — because I forgot all about this game. Brandon0151 — because the image really creeps me out for some reason. DarrisBob1 — because not so meh. GiantBoyDetective — for fulfilling his obligation. sirponkcelot — for referencing The Wizard. Bizwax — for incorrectly referencing The Wizard, and then convincing us. Ganonthegreat1 — I see what you did there. Zhesty — for ruining my AI fantasies. xbattousai666 — for my next tattoo. Hundredgunner — for the win. Congratulations to this week's winners! Come back next week of a fresh contest and an even fresher contest judge.